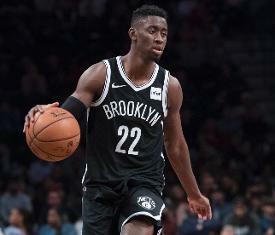 Caris LeVert will return for the Nets in Friday's game against the Bulls, coach Kenny Atkinson said Thursday. LeVert has missed the last 42 games after dislocating his right foot in Minnesota on Nov. 12. He practiced earlier this week with the G-League Long Island Nets and the team had reportedly expressed optimism he could return before the All-Star break. In the first 14 games this season, LeVert led Brooklyn with 18.4 points per game and hit game-winning shots against the Knicks and Nuggets. The 6-foot-7 guard expressed his excitement about his pending return.
.@CarisLeVert on rejoining an upstart team tomorrow night: "I can't wait to be a part of that." After winning just two of the first 12 games following LeVert's injury, the Nets reeled off seven straight victories and have surged into sixth place in the Eastern Conference. Brooklyn is nearing full health for the first time this season as Allen Crabbe re-joined the team for Wednesday's win over Denver. Crabbe had missed time with a right knee injury. LeVert will help make up for the absence of Spencer Dinwiddie, who is recovering from right thumb surgery. The team reportedly traded for Raptors center Greg Monroe and a 2021 second-round pick before Thursday's trade deadline. The Nets are expected to waive Monroe and will maintain an open roster spot.